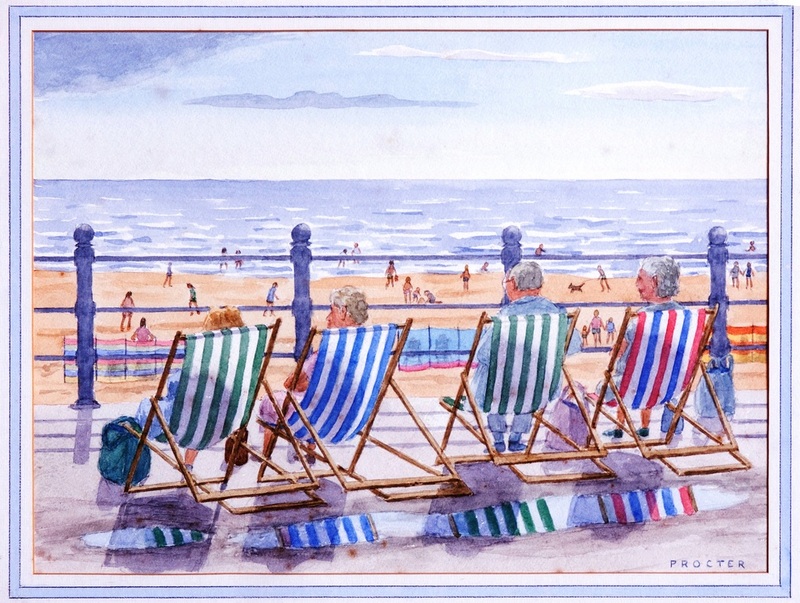 This watercolour painting by Henry Procter, who was known for his holiday and deckchair paintings​, is a classic image of the typical British holiday scene of the 1950s. It is almost a pastiche of the comic postcard of the time without the “Wish You Were Here” balloon; or indeed the comic funny faces, the ladies’ large bottoms and bosoms. The sea is close to the shore and we can see, through the Victorian railings, lots of people, mainly children, on the beach, paddling, bathing, playing games, walking a dog and no doubt building sandcastles. The four striped deckchairs are spread across the front of the picture plane rhythmically, first a green and white, then blue and white followed by green and white and finally a red, blue and white stripe, which stops the eye and holds us within the frame. Behind the wooden chairs we notice reflections of the striped chairs on the foreground where the rain glistens in the light and the shadows of the chairs are at slight left angles contrasting to the slight right angles of the chairs, suggesting three dimensions to an otherwise flat surface. The stripes in each of the four reflections are of the same hue value as the individual chair colours which the artist has used in order to add weight and space, enabling the deckchairs to be firmly grounded down by adding depth and space, separating the viewer from the scene. We are on the promenade; we are voyeurs, blocked by the chairs with the apparently elderly people sat on them as they are separated from the beach by the old fashioned railings. Distance and depth are emphasised by the size and detail of the figures and chairs in the foreground compared to the suggested forms in the distance on the beach. Height is expressed in the composition by the broad, flat landscape view of sea and sky merging with the sandy pale beach that we look down onto with the small figures below. It is a moment in time caught on canvas. It could be a flashback of memory from your past. No one real event is taking place in the moment. The figures seem to be just watching and looking ahead, taking in whatever draws their eyes and enjoying the good fresh air in the holiday resort of Blackpool. Henry Procter was born in 1914 at Leach Lane, St Annes on Sea, to William Eastwood Procter and his wife, Elizabeth. He had an elder brother and sister, Harold and Helen. He was educated at King Edward VII School. It was whilst Leader of the St Annes Congregational Church Scout Troup that he developed his love of photography and fell-walking in the Lake District. After his war service he became a Children’s Officer in Somerset and then Essex. In 1956 he returned to St Annes as an Assistant Education Officer in Blackpool and in 1960 he was appointed Vice Principal of Blackpool College of Technology and School of Art. The first recorded oil painting he produced was of a French Scene in 1959. In the early 1960s he joined both the Lytham St Annes Art Society and the Blackpool and Fylde Art Society. It was at this time that he started entering his paintings into the regular exhibitions which they held. Later, he also became an active member of the Lytham St Annes Photographic Society. As a keen fell-walker and photographer he often gained his inspiration from the Lakeland landscapes and the Fylde foreshore. His first solo exhibition was in November 1969 at Lytham St Annes Art Society. The paintings depicted objects he found on the St Annes foreshore and included a painting of Bob Harrison, the last horse drawn shrimper from Lytham. There were also a few Lakeland scenes. In 1975 he changed from painting in oils to using watercolours. It was in 1976, the year of his retirement, that Henry and Mary, his wife, went on the first of four trips to visit her brother in New Zealand. There he painted New Zealand landscapes and flora, becoming an honorary member of the Otago Art Society. He exhibited and sold many of his New Zealand paintings in Dunedin during these trips. By 1979 Henry was a committee member of the Lytham St Annes Art Society and Chairman of the Fylde Arts Association Visual Arts Panel, a position he held for around 10 years. That same year he had a solo exhibition at the Garstang Arts Centre, showing mainly Lakeland scenes. Henry’s first 'Deckchair Painting' was produced in September 1982 and was entitled You can paddle later. It featured his eldest grand-daughter, Louise. This was the start of his very popular 'Promscapes', featuring deckchairs on Blackpool promenade with scenes and activities on the beach in the distance. In April 1983 Henry held a solo exhibition in the Grundy Art Gallery entitled 'Fylde Coast and Fell Country'. This was the first exhibition to feature his deckchairs. By 1983 Henry was a member of the North West Arts Visual Arts Panel. During this time he helped organise four National Exhibitions of British Prints at the Grundy Art Gallery, Blackpool and established the Fylde Arts Collection of 44 prints. He held a joint exhibition with Elizabeth Worsley in August 1984 at the St Annes Art Gallery then, in the September, he exhibited at the Blackpool Art Society Centenary Exhibition at the Grundy Art Gallery. and in July at the Garstang Arts Centre. Henry’s last known solo exhibition, at the age of 79, entitled 'Promscapes', was in the winter of 1993/94 at the Grundy Art Gallery. During his lifetime he recorded about 475 completed paintings and he was still painting at the age of 89, continuing to be an active member of the Lytham St Annes Art Society right up to his death in April 2004; helping at a coffee morning earlier that month.